Your message has been sent to Larry . Like authorSTREAM? Give us a +1! 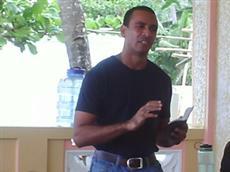 Larry is a missionary in the Philippines since 2007 and the Executive Director of Basketball Links. jhensene uploaded a new presentation "Relationships"
jhensene uploaded a new presentation "Obstacles in Evangelism"
jhensene uploaded a new presentation "God of the Possible"
jhensene uploaded a new presentation "Doctrine of the Law"
jhensene uploaded a new presentation "Christian Character"